Although overseas development assistance for forests appears to have modestly increased in the past few years, and although many new promising mechanisms and sources are emerging, analysis reveals that the gap between the needs and existing funding for sustainable forest management is still very wide. There is a need for substantial new and additional funding from all sources to support sustainable forest management and make implementation the Non-Legally Binding Instrument (NLBI) effective on the ground. In 2008, PROFOR financed analysis of funding sources and gaps towards implementing the NLBI in preparation for deliberations at the UNFF's Ad-Hoc Expert Group on finance. This analysis presented an overview of the specific elements of the NLBI, including national measures, multilateral assistance, international cooperation and corresponding existing sources, and drew conclusions on the gap between existing financing flows and actual needs. 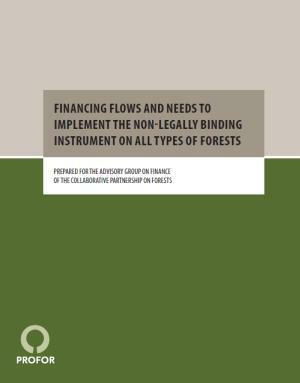 It served to provide policy advice to the Advisory Group on Finance of the Collaborative Partnership on Forests and the Director/Officer-in-Charge of the UNFF Secretariat on investment flows and finance schemes. The study team developed a methodology for the mapping exercise, conducted analysis of the availability and scope of current funding sources, reviewed new developments in the climate change regime relating to forest finance and accessing sources and mechanisms for implementing the NLBI, and identified sources of funding for the various countries according to multiple criteria, as well as funding gaps. The analysis concluded that there was a substantial need for new and additional funding from all sources to support SFM and make the NLBI implementation effective on the ground. Although many new promising mechanisms and sources were emerging no serious deliberation to define and develop a SFM-specific funding mechanism or instrument existed. Although ODA for forests appeared to have increased modestly in recent few years, concerted efforts were needed from both donor and recipient countries to mobilize more resources.